I like these topics that come completely unexpected and force me to learn something first before tackling the data. Admittedly, I’ve never spent a single thought on who is behind these creations for newspapers, websites, magazines, etc. 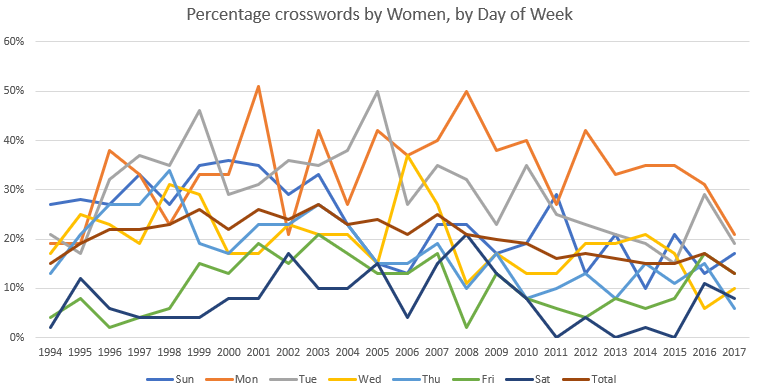 Now I know about the legend called Will Shortz and I’ve learned that creating crosswords is yet another area which seems to be dominated by men, whatever the reasons behind it. Weekday and Years, Weekday and Months, Weekday and hour of the day – all of these make me think: I could use a heat map for that!